Michele Bachmann: submission for thee but not for me? It is so easy to find a flattering photo of Michele Bachmann! Now, that’s a fine definition of a companionate marriage, the kind of marriage that most Americans believe in. It’s not at all a definition of wifely submission. There is in fact a large evangelical literature out there by both women and men that defines wifely submission as something totally different from respect, let alone an egalitarian marriage, but I’m sure that Bachmann is right to be confident that the secular media won’t bother to do their research and the Christian media will give her a free pass on this one. Is it necessarily a sexist line of questioning or an unfair standard applied only to conservative women? I don’t see it that way. Some of Hillary Clinton’s most ardent opponents in 2008 insisted that her candidacy meant that “Billary” was gunning for the White House again. Furthermore, you can say a lot of things about Sarah Palin’s politics and public persona, but “submissive” is not one of them. Bachmann on the other hand opened the door herself to this line of questioning in ways that Clinton and Palin never did. Does that mean that Michele Bachmann’s presidential candidacy is a mere stalking horse for her husband’s political ambitions, and that he would be the true power behind the throne? No. This seems to me like just another example of the rhetorical and moral flexibility of some evangelical Christians who think that biblical and moral rules only apply to the little people, and that Great Leaders whose salvation is utterly assured can indulge in the very things they rail against because, well, they know they’re saved. Frank Schaeffer has written and talked about this in the context of his own family, whose spiritual leadership and teachings were very influential in Bachmann’s life, according to this intellectual biography of her by Ryan Lizza in The New Yorker this week. These evangelicals can claim moral and spiritual solidarity with the “little people” whose votes they need, while in fact organizing their personal lives and political agendas very differently. And it’s all good, because it’s in the service of God. That answer tells me she has good handlers. It sounds like she just went with the old tried-and-true editorial strategy of “revise and RE-submit.” Most politicians hand out whatever differently-shaded versions of the basic boilerplate depending on time, place, and their perception of the audience in question, and hope that no one tracks the “drafts” through time. Which is the rhetorical version of a “hail mary” pass in this technological day-and-age. By the way, I also loved the report about Mitt Romney’s duel with hecklers in Iowa in which he insisted that “corporations are people…” They are not neither, but that clip should have a pretty extended shelf life, I would expect. I think that initial iconic JFK speech was in West Virginia rather than Texas, but memory generally ill-serves if you’re not a historian of the period in question, and he probably gave multiple versions of it. Whoops, no, Houston! Shoulda done the research, then hit “submit.” Historiann’s right. It also makes me think of the sixteenth century rhetoric regarding women rulers. Remember how carefully the English courtiers arranged Mary Tudor’s marriage agreement with Phillip of Spain? The expectation was that a woman would naturally and utterly submit to a husband and thus a married woman ruler became a cipher for her spouse. That concept’s gone out of general use, but I still hear it evoked in a number of evangelical circles, not only those who are socially on the right. I think Indyanna is right that it’s not just some evangelicals, it’s all politicians that shade their responses depending on their audience/s. That’s an important part of the equation. I agree with Rachel that a follow-up would have been very helpful–if you’re not going to press her on it, then is it really an important issue–but that goes to my point about how the secular media won’t make an issue of this. It was a kind of a “gotcha” question that Byron (York?) never intended to follow up. He had made his point by merely asking the question, he doesn’t care about the larger issue it raises about Bachmann and leadership. Good point about 16th C court politics, too, Janice. It’s not like these questions about women and leadership don’t have a history (and even a specifically Christian history). I go with Historiann. Bachman states very clearly that submission is not part of her marriage. Hers is based on mutual respect and love. Similarly to most haves, submission is for the have nots, haves have the Lexus version called Respect 555.
hold on, hold on, though. A friend of mine grew up in an even more restrictive evangelical group than I did, and she’s been doing some great blogging and tweeting about gender, complementarianism, and evangelicals over the past year. She insists that in these circles, “respect” is really code for “submission,” and that evangelicals of this kind know the kind of buttons that submission push for those of us not into complementarianism, and so they use “respect” in public, as it were. I tend to agree with her analysis, and she tweeted about this yesterday during the debates: so I’d say that Bachmann’s in fact doing exactly as she preaches. Fascinating post, Historiann. My interest in it isn’t so much political–I can’t conceive of anyone with a healthy enough ego to run for president who would actually turn real power over to someone else–but theological and cultural. As a Christian with strong evangelical sympathies (side note: evangelical is not identical with conservative), I encourage commenters who are pointing at the dictionary to broaden their perspective. The questions “what does it mean to submit?” and “how should Christians interpret biblical passages calling for wifely submission?” are lively, impassioned and highly nuanced in many evangelical circles. Think of how non-academics often look at academic debates that turn on sophisticated competing analyses of language and context. Personally, I think it would be awesome if candidates like Palin and Bachmann led to renewed intra-evangelical debate about gender roles. In a positive way: I would like to see traditionalist unequal attitudes loosened up. And in a negative way: I wouldn’t mind seeing traditionalist evangelical voices criticizing female Republican candidates, thus weakening them and also reminding the broader society that the critics Are Not The People We Want To Be Influential. thefrogprincess–thanks for the intel and the other links. That tracks with Mark’s comment about looking for the nuances in evangelical language & meanings–a great point. I still say that Bachmann doesn’t practice what she preaches–thefrogprincess’s comments just show that she’s even craftier in using evangelical dog-whistle language that means something else to non-evangelicals. As Mark says, it’s just not in the DNA of people who throw their hats in the presidential ring to “submit” or “respect” to anyone. It is a game of saving face with what rhetoric serves a group that serves one’s purpose at separate times. It is where face saving meets an axis. Deep in the hearts of idealists lie a belief that a gotcha will wake a person up and force them to become the person that idealist needs. Deep in the heart of an idealist the thought of serving two opposing rhetoric should not prevail. But, it is the new order. It is here to stay. There is no shame in crawling across the axis of opposing rhetoric, but sympathy, sympathy because so many players have been there and done that. There are no pure candidates, nor have there ever been, however, there used to be some that kind of looked as if they wanted to aspire to be somewhat not-hypocritical. Now, we are struggling with accepting the fact that there are no candidates that can even pass as an imprint of almost, sort of, kind of not-hypocritical. There is no mold. It is all smoke. Christian media will give her a free pass on this one. No, they won’t be giving her “a free pass”. In the fundamentalist moral calculus, it is a good to lie to people if it advances the goal of increasing the influence of their sicke fucke depraved ideology. Aside from the fact that any professional and ambitious politician worth hir salt understands how to wriggle out of an awkward moment, I would also call attention to the fact that Bachmann may well actually *believe* what she says. Remember, it’s not a falsehood if you believe it to be true when you say it. Thefrogprincess and Mark K. make really good points about how freighted language is deployed carefully by public figures in disparate circumstances, and I think that suggests that possibility, at least, that the people who utilize such language do so because they think they really mean it, and that they can have their cake and eat it, too. CPP’s point is well taken, but I don’t think true believers of this sort would even consider it a lie — even though they are often quick to claim the same of (suspected) Muslims by invoking the concept of _taqiyya_ or equivocation. ‘Equivocating’ suggests that you know, deep down, that you’re not answering a question as fully as you could, and that you are perhaps cherry-picking meanings of literal, figurative, etc. implications that support your argument. Being “difficult for the secular mainstream media to comprehend” is a whole other kettle of epistemological fish. I’m going to try very hard right now not to let loose with a crack about how the entire GOP prospective leadership has thrown in its lot with a crypto-Christian fascist fringe that seems to pick candidates based on how utterly delusional they are. Did I pull it off? The move to ‘respect’ rather than ‘submission’, however, never removed the requirement of obedience, but this language continues to be pervasive in Evangelical Christian circles. And, as Mark says, because ‘respect’ became the norm, rather than submission, it allowed many couples to renegotiate the terms of female submission in a wide variety of ways. I spent eight, long years as an adult in a Bible-believing (literalist) evangelical church which was dominated by fairly young,m very-well educated people. As an unmarried woman and a feminist, I was frequently questioned exact meaning of the verse about ‘submissive wives’. The first answer was always that, while wives were to be submissive to their husbands, husbands were required to love their wives as Chist loved the church. When I pressed further, it was made clear that there can be only one “pilot” in a marriage and that person, by scripture, was required to be the husband. That didn’t mean that wife didn’t have input but it did mean that the final arbiter in any disagreement whether it involved family monetary policy or how to raise the kids, the husband had the final say-so. That was one of many reasons that I eventually left that church. Well, if you read the 17th century manuals, they all waltz around this one — so it’s nothing new. Fran Dolan’s _Marriage and Violence_ has some terrific discussions of the relationship between 17th C marriage manuals and 21st C conservative religious ones. Fran Dolan’s work is brilliant. I know that she was beaten up by some historians for comparing the early modern period to the 20th & 21st centuries, but I think it absolutely works. As to the dictionary/commonly accepted definition versus the creative evangelical usage of language: I guess it shouldn’t surprise us that in addition to living in a a parallel universe with different science, different history, and different constitutional law that they also have different understandings of language. I guess the question for Americans is, do we want to live in that universe, or does the for-now dominant episteme work better for us? Historiann, I have been on vacation, which should explain my tardy, tardy response. 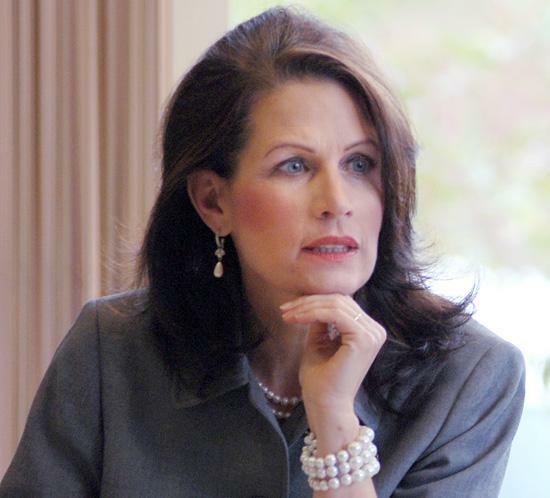 Bachmann’s use of submission equal respect follows along the lines of other commentors as a skillful way to handle a potential problem for the media. I plan to write about this soon because Bachmann’s use of submission/respect feels different from some of fundamentalist and evangelical language on gender roles. This could be politically strategic, of course. I find myself more interested in her use of motherhood to claim political authority, which echoes my work on the gender dynamics of conservative Christian women in the 1920s Klan. Thanks, Kelly–please let me know when your post on Bachmann’s submission is up so that I can link to you!